First giving honor to the Source of Creation, and to Speaker Ralston, Representative Cannon, Representative Waites, the other kind members of our Georgia House of Representatives who signed this resolution, the LGBTQ community leaders, advocates and friends who worked to see this happen: I am so humbled. I am overwhelmed with gratitude for this honor, because it is given out of respect for the work I did with hundreds of other people, for whom today I must stand in their stead. Many of my friends, colleagues, and fellow volunteers are not here any longer, because they have ended their struggle with HIV/AIDS. They still inspire me, and many of those people feel especially close to me today. I did none of the work you have outlined alone. Mostly, I was attempting to do my part, which was not always as the recognized leader of the project, the research, or the campaign. I am fortunate that people and our organizations found my work useful and often called me to help. I now know that I was doing ministry before I could call myself a minister. What is quite a significant sign of progress in our times—even with what currently may seem like monumental set-backs—is that when I started doing this work, this very body was the most feared entity to our work. There were, to be honest, some more dangerous senators in Washington D.C. whom I will not name. Now I am a guest with my husband on the floor of the same legislature, receiving this resolution where once we were afraid of losing whatever little support we had. We had so little funding fighting the epidemic and caring for folks who had HIV/AIDS in the earliest, difficult days of the epidemic. Not only am I now standing here, but as a guest of brave, elected African American and other allied members of my community. This is miraculous in the short time of long suffering that has transpired. May I never do anything to lose the respect that difficult, crazy but rewarding work has afforded me, nor the love of the people who were and are still most affected by this horrible disease. 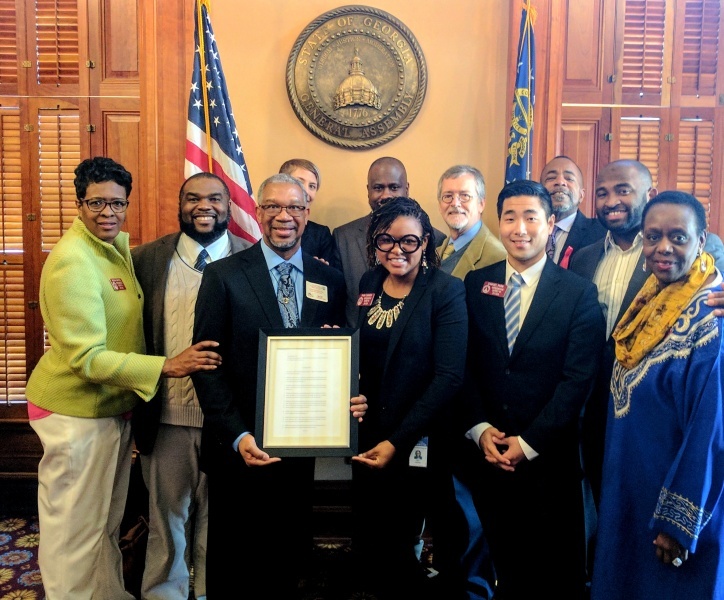 I accept the honor of this resolution, acknowledging that I also stand for many others sharing this work, and pray that the day will come when there will be a resolution of celebration that HIV/AIDS is no longer a concern in lives of citizens of Georgia. May we be the first state to do so. Then we can truly celebrate. Thank you so much.